I started a blog because I thought there needed to be one more voice in the 476,492,292,928 others that were already out there. I realized I enjoyed writing once I started it and got on a roll. About eight months in, I realized that people were being fired from their jobs for putting their opinions and views on social media. That worried me, because – let’s just say – I’m not a front line employee at a Fortune 50 company. I certainly didn’t want to get fired over my opinions about personal finance, of all things. I’m highly annoyed by our American way of life…in which almost everything people buy is viewed as a consumable. A $1,000 iPhone that breaks? Just get a new one (not sure why you needed a $1,000 iPhone anyway on a $25,000 annual salary). Your five-year-old car had to have some work done on it? Let’s lease a new one so we have a dependable car. Oh, and by the way, let’s lease a $65,000 four-door truck that will sit on the curb in the weather because our garage is so full of crap that we can’t fit it in there. Not to mention you’ll never haul anything in it. So, I took my blog anonymous and by the way, I don’t read bloggers who are anonymous. So, I shut mine down. I don’t like to be dodgy. We live in the DFW, Texas area. I love it because of the weather. Pool season starts in early May and goes through late September. Fire up the pool heater, and it’s a great way to spend an afternoon or evening when the rare ice storm comes our way. My wife hates North Texas because of the heat. It’s easily 100 degrees here most of the Summer, and in the 90’s on the late end of Spring and the early tip of Fall. It’s not rare for it to reach the high 60’s in February. We moved here from Pittsburgh, PA and I was just glad to get out of the snow, cold and salt that lives on the roads most of the year there. While there is no state income tax in TX, the sales tax is higher than PA and most of our roads have become or are becoming toll roads. So, at the end of the day, it costs the same to live here as it did Pittsburgh. But, there’s so much more here. Everything can be close if you carefully choose where you live. I live four miles from work, and most any restaurant, doctor, hospital, grocery store, etc are within walking distance. We moved in before the latest housing boom, and have seen an “on paper” increase of 53% of our home value. The county assessors don’t miss one second of raising your taxable rate, so our real estate taxes went from $3,600 (in 2009) to over $6,300 today. That’s a big increase. This is happening because several fortune 500 companies have moved here. Just last year Toyota moved here from California and more are announcing their move to the area daily. Where roads exist just in the last year, we remember the only pedestrians just two years ago were cows. On one recent day, I counted no less than 24 cranes within my office view. Mr. 1500 note: Whenever I’m in a city, I always count the cranes. Cranes == booming economy. However, once a person binges on everything in a new locale, at the end of the day s/he going to do the same things: sleep, work, eat, spend time with a spouse, make some friends and save some money. I can do that anywhere be it North Texas or East Tennessee. How old are you and what’s your family situation? What do you do for a living? I just turned 50, married with no children. I am a managing director for a Fortune 50 company. My base salary is a tad under $200,000 with bonuses and stock options comprising another ~$130,000+ annually (in most years). Our Federal Income Tax bill is very high and takes a large chunk of our income. My wife doesn’t work, she “retired” when we moved here when she was 39. She is/was a high school English teacher. Now, she spends most of her days taking care of our two dogs and spends a lot of time working with the dog rescue of which she sits on the board. Plus, she takes care of literally everything at home, ensuring I can spend all the time necessary to work my job – it’s truly a team effort. We live on ~$55,000 a year and save the rest. I do not max out my 401k any longer. I look at pre-tax contributions as “old age money”, meaning we won’t draw on it until RMDs. But, I already made a mistake with it – there’s too much in there and it’s going to be near impossible to keep our tax bill low in retirement. So, I’ll probably have to reevaluate our distribution plan to minimize taxes. My goal has always been security versus financial independence, and I’m of the mindset you can never have enough. This is all based on how I grew up and what I saw as the scarcity of money necessary to flourish. I need to work another ten years to ensure that our investments can generate four times the level of income as need today to cover our expenses. If the models say 98% likelihood of reaching our goal, I’m working longer. Mr. 1500 note: My mindset is the opposite. I was just looking at a table that said I hav an 85% chance of my money lasting 60 years. I’m more than OK with that. Personal finance is indeed, personal. Having said that I’m of the mindset that you can never have enough, anyone reading this knows that’s bologna, but I’ve not mentally overcome that I have “enough” and have accepted that’s how I will always think. In my mind, the next catastrophe is just around the corner. As far as where we are on the journey, I mentioned another 10 years of working and saving sets us up nicely with $200,000+ income annually once I hit age 60. Our expenses are about $55,000 annually, so I think folks can do the math on that one; essentially, we’ll have a cushion of four times our expenses. The “problem” is I enjoy what I do and I have a great boss. She and I have talked on several occasions about why would I ever want to retire. I told her it was about having control over my time, not the money or anything else. So, she proceeded to explain to me that I can work when I want, how I want and from wherever I want. Mr. 1500 note: Wow, you have a great gig there Jake! My reaction: crap. How do you react when your boss just told you it’s okay by her if you “work” like you’re already retired? Now, I think there’s still a need to set the right example and be there for my employees, so it can’t really be “ like I’m retired” but the point is a person’s mind shifts pretty dramatically when your boss has a response like this to your desire to have more control over your time. Add in unlimited and untracked vacation time, why would I ever leave? A while back I had our financial position reviewed by Hanson McClain advisors (a fantastic group, by the way; check out their podcast and website). I did not end up hiring them, but they spent hours with me understanding our situation. They came back and said “there’s no reason to work past the age of 60, but let’s talk about how many friends you have and what your hobbies are”. My response: “uh, what’s that have to do with anything?”. They proceeded to explain to me their research on people in my situation. Work a lot, have moved a few times, hitting 50 and don’t have any close friends. Long research story short, those types of men generally die soon after retirement versus men who have a strong circle of friends and a lot of hobbies. Combine that with my personality (I have to have a problem to solve), they recommended I never retire. So, I have a lot to think about. I’m still probably going to retire at age 60 because I want to do a lot of hiking in our state and national parks, but I’ve gotten a bit more free with our spending. We take a few trips a year now (like two or three), we do things like fly first class (because if I don’t, whoever inherits our money will) and I stopped worrying about things like our grocery bill (but I’m still irked by our food waste). Once I do retire, I’m pretty sure I can fine tune our grocery bill to less than $50 a week. We’ll see in 10 years. Maybe I’ll create an app. By the way, we are closet FIRE people. Almost no one knows about our financial situation. We live in a $200,000 house in a solidly middle-class neighborhood and drive one 11-year-old car and one 7-year-old car. When we buy cars, we buy new or slightly used cars, because we drive them until they can’t be driven any longer. Our favorite restaurant is a pizza by the slice joint and a walk up Chinese food joint. We did do the $100 meals a few times a week for a while, but eventually high priced steak ends up tasting like soap after you have it a hundred times (not quite, but you get my point). Now, give me some whole foods out of my fridge and I’m a happy guy (and I feel much, much better). 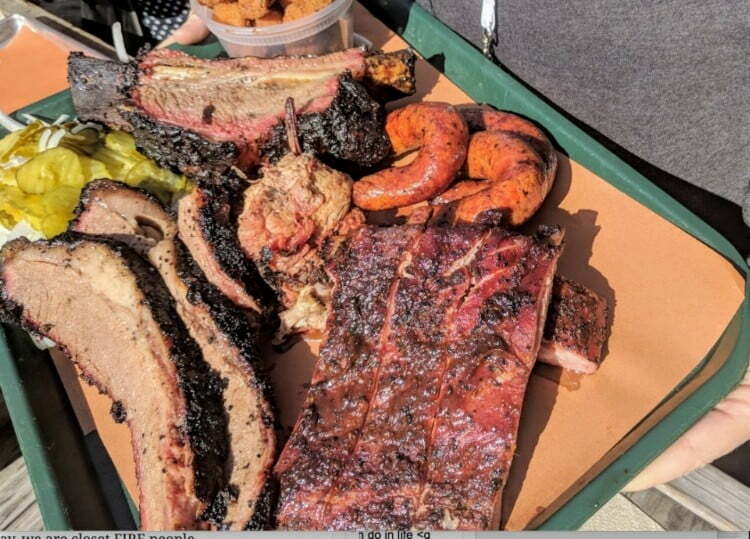 What, no Texas BBQ Jake? Evil genies aside, what is your investing strategy? Stocks? Index funds? Real estate? Crypto? I’ve played around with a few individual stocks, but it was just too time-consuming, especially after reading “A Random Walk Down Wall Street” and “The Intelligent Investor” and understanding the research you’re supposed to do. We don’t even do index funds, now. We use Vanguard target date funds, with a few hundred shares of Berkshire Hathaway “B” shares (they’re an index themselves with 63 companies owned by last count as well as the other public companies it invests in) and Apple. We need to unload the Apple because of how much Berkshire now owns. Of course, we have a lot of my company stock due to the options that are granted to me each year. We have our investment dollars in target-date funds primarily because they automatically rebalance and with Vanguard, they don’t charge a “fee within a fee”, as many companies do. Due to the size of our investments with Vanguard, we average 5 basis points for investment expenses (yes five, not a typo). I’m not sure how much less expensive I can get, although I understand there are now some ETFs that have zero costs associated with them. What’s the best thing you ever bought? The worst? I’ll change this question up. The best decision I ever made was who chose to marry. All things aside, I think a spouse is a top determinate for a successful life. Sure, the supportive of this and supportive of that aspects are necessary, but “built-in frugality” is essential. A spouse who is just as happy on a $1,000 vacation as a $10,000 vacation is a diamond in the rough. Mr. 1500 note: I couldn’t agree more. There are three “worst” decisions. First, we bought a new car when we didn’t need it. Second, buying a country club membership and realizing three years later it wasn’t the value I thought it was (we dumped it and ate the $30,000 buy-in fee) and third, having pets. That last one can draw a firestorm of response, and while I love our dogs, I didn’t realize at the outset that they would end up costing us (in terms of future value of money) about $500,000 over our lifetime. If you do the math, taking into account food, vet bills, boarding, everything they require, you should get pretty close to that number (of course, you have to adjust up or down for the number of pets you have). We’ve had up to three at one time as well as for a 26 years span of time. Our plans are no more pets after the remaining two depart to the afterlife. Mr. 1500 note: I’m a big fan of houseplants! First, we bought a new car when we didn’t need it. Second, buying a country club membership and realizing three years later it wasn’t the value I thought it was (we dumped it and ate the $30,000 buy-in fee) and third, having pets. That last one can draw a firestorm of response, and while I love our dogs, I didn’t realize at the outset that they would end up costing us (in terms of future value of money) about $500,000 over our lifetime. If you do the math, taking into account food, vet bills, boarding, everything they require, you should get pretty close to that number (of course, you have to adjust up or down for the number of pets you have). We’ve had up to three at one time as well as for a 26 years span of time. Our plans are no more pets after the remaining two depart to the afterlife. For years, down to the penny. It was excruciating. Now, I passively track it, but we have changed up our view of money significantly. The first thing we do is pay ourselves. We put money in all the investment and savings vehicles first, and we no longer care about where the rest of the money is spent. But I have Excel spreadsheets that go back 20 years, tracking every penny we ever spent. In fact, I don’t even balance our checkbook anymore, because I can download everything into Quicken and it takes seconds to evaluate our spend. The number of people who do it and “document their journey”. I can’t overstate how dangerous this is. Not for the people documenting their journey, but for the people who are searching for inspiration and tactics. Until you’ve reached financial independence, a person’s journey is actually just an opinion. I know that sounds harsh, but I believe it’s the truth. If you give it some thought, none of us would go to a personal trainer who was 100 pounds overweight because they were telling us about their journey while working you out, or you wouldn’t take hockey lessons from someone who doesn’t know how to ice skate. So why would you read or follow or implement the tactics of someone who has incurred a bunch of debt or made bad life decisions and are now writing about how they are digging out. I also find the majority of bloggers are running from something and not to something. But what I’ve overwhelming read, through 1500 Days MMM, JD Roth and others, is you found running from something ended up not being fulfilling. Mr. 1500: Truth. Running away from a bad situation isn’t the right reason to pursue FIRE. However, the bad situation is what put FIRE on my radar, so I’m thankful for the rough times. And that’s where the shortcoming of almost every FIRE blog falls. I know the majority of people hate their jobs, so instead of running from it I think instead people ought to be encouraged to find work they enjoy. Mr. 1500: And this may be the best part of FIRE. Even if you’re not sure where you’re running too, FIRE gives you options and freedom to find out. Who cares if you’re making less money in the whole scheme of things. Almost every single person who finally “makes it” will tell you money isn’t everything. So, either they’re lying or it’s true and the 99% of us can’t understand why – sort of like how it’s difficult to learn from the advice of others; but, too many people have to learn the lesson the hard way instead. I think marketing and social media is partly to blame (gotta have what they’re selling or we won’t be cool) but coupled with a heavy lack of accountability to ourselves. Look, no matter what anyone preaches, work matters. It provides us with a social circle, provides us with a way to sustain our life (not a bartering system any longer) and our lifestyles but more importantly it makes us feel good when we contribute to society. Put a person on the couch all day and give them everything they need and I’ll show you someone who – in less than one month’s time – will start to look for something to do. That alone tells us that good work matters. Plus, all the research out there confirms it too. So, we should instead encourage people to find work they’ll like and not care only about the money. I know, it’s easy to say when you find yourself in my position, so I don’t want to get too preachy, but I believe there’s truth to this. We live pretty simply, but we do fly first class when we do fly and pick up the lunch/dinner tab when we go out with friends. We also put less time into finding the best hotel deal or rental car deal – we just book what we want – we’ve become willing to pay extra for convenience (on-site airport car rental, for example) and being apart from the general masses (think one level below Ritz Carlton, Four Seasons where hotels are concerned, lower bowl close to the ice during hockey games, for example). We also don’t think too much about how much we spend when getting our favorite people gifts for holidays or birthdays. For a couple of years, we had season tickets to the Dallas Stars, but traffic exploded here in North Texas and it became immensely difficult to traverse…could take 1.5 hours to go the 14 miles to the arena. Unfortunately, public transportation was not much faster. DART takes a minimum of 70 minutes and costs $10 each way, plus you’re taking your life into your own hands in the DFW area by doing so (check out all the reports about stabbings and murders on public transportation in DFW and you’ll know what I mean). It was actually cheaper, not to mention safer, to drive. That our leaders – be they business, religious or political – have our best interest at heart. I think they have their best interests at heart. Think of it like this: who, besides Warren Buffet and Charlie Munger talk about the owners of their stocks as “partners” AND says there’s almost no one who should own BRK stock unless you have the same philosophy as they do?There’s no one. The financial example I always use relates to traditional pension plans. When I entered the full-time workforce in 1992, I went to work for a highly respected company where one of the largest draws was their traditional benefit plan – and man was it rich. Based upon my career aspirations and knowing my work ethic would easily take me there, I calculated that – between social security and the pension plan – I would end up with more net income at the early retirement of age 62 than when I actually worked. So, I put 10% aside knowing that 10% plus the compounded growth would be significant icing on the cake. A world cruise? Of course! Well, we all know how this story ends. 24 years later, the company pulled the traditional pension plan out from under us. They’ve passed – and continue to pass – higher medical costs to us. In other words, they didn’t hold up their end of the deal. I understand, they had to do it to survive, or so the story goes. I don’t know, I think when you make an agreement, you stick to it. Anyway, I didn’t have enough foresight at age 22 to anticipate this, otherwise we would have put aside 30% to 40% of our income at that young age. There are numerous other examples that I could add to underscore my point, but I digress. First, that what you put into your mind is what you become. If you don’t believe this, run an experiment on yourself. Do nothing but read literature about running and eventually, you’ll want to – and probably start -trying to run. I’ll bet you even start watching races on TV. Watch the Food Network for weeks on end and you’ll find you start cooking – or buying – amounts of food you’d never have thought to cook or buy prior to watching it. Read avidly about fashion and soon you’ll find yourself wanting to purchase “high quality” fabric and custom made items, even though you work in a place where jeans are totally acceptable. Read avidly about saving and investing, and you’ll probably become a saver and an investor. I believe this is the one area where we are in control – we can control we put into our minds and hence control what we think about and in turn control our habits. Second, to personal finance, the biggest pet peeve of mine is weight and mobility/conditioning. I’m not talking about looking like a runway or underwear model. I had bought into the idea that maybe I didn’t have as much control over my weight and conditioning as I thought, and I searched out literature that confirmed my bias. But then I thought that was being ridiculous (and the literature not quite honest) and decided to try something different. What got me questioning this was that there was never a time when a doctor didn’t tell me I should lose some weight to benefit my health. Plus, the diet industry is how many billions of dollars? Plus, everyone is always talking about getting fitter, thinner or more healthy. The only people saying it’s okay to be 50, 100 or more pounds overweight were the people who weren’t 50, 100 or more pounds overweight. It didn’t add up for me. So, guess what? I lost 25 pounds in just 12 weeks and another 10 over the next several months. Let me tell you, if I can do it, anyone – sans a true medical condition – in this country can do it. There’s a lot more, like how often people switch employers now (and end up with one year of experience 10 times instead of 10 years of experience), or how people don’t realize the hundreds or thousands of “Facebook” friends they have will not be there for them when it matters most and so much more, but I’ll leave it at that for now. I used to be “one of those” Crossfit people. For three years, five days a week, but like almost everyone, I ended up with significant injuries – shoulder and calf. Then I gained about 40 pounds. Now, I walk. A lot. Combined with counting calories, I’m at one of the lower weights I’ve been. Probably a lower weight than when I did Crossfit. I had to completely replace my wardrobe because my pants wouldn’t stay up and my shirts could hold three people. I eat mostly whole foods. I had a Big Mac the other day and felt horrible for the following two days. I stuff myself on whole foods such as broccoli, nuts, fruit, lettuce, corn, beans, beef, tortilla’s, etc. and I feel better than when I didn’t eat those foods. I skipped the scale once this August (2018) and discovered I’d lost 7.5 pounds when I got back on it. I have no idea how except I eat a lot of whole foods and walk a lot. Oh, and I don’t exceed 1,980 calories a day. I know people are reading this and saying there’s no way I can be stuffed eating 1,980 calories a day, but it’s the truth. Note though, I don’t count fat calories, nor do I count my alcohol intake because I rarely drink so when I do, I enjoy it instead of furiously tracking it. Admittedly, my hunger does wake me up in the middle of the night several nights a week so I try to time a snack with bedtime in hopes of my sleep not being interrupted. I may need to increase my calorie intake to avoid this but I still have a few pounds I’d like to try to lose just to see if I can. State and national parks. We’ve got our National Parks Passport Books and have been checking a few of them off. Big Bend National Park was off the charts amazing (and I discovered during that visit there really isn’t a border between the U.S. and Mexico), Palo Duro Canyon near Amarillo was stunning, we’ve hiked in the Great Smokey Mountains, I’ve hiked out West in Wyoming, Utah and so much more. I find being outdoors reenergizing. The one “dream” we’ll probably never engage is traveling the U.S in a class A RV. The dollars just don’t compute. No matter how we slice it, spending $100,000 to $200,000 on an RV is way more than we’d ever spend in 10 or 15 years staying in hotels doing the same travel. The obvious benefit of an RV is it’s not a different hotel every trip, you can stay in the park and you can cook your own food. But adding the operating expenses on top of the depreciating asset, I’m not sure how we’d ever pull the trigger. Very nice deep interview. Great job. There are many nuggets of wisdom here. I think FIRE blogs should encourage readers to find fulfilling work too. But it’s not easy these days. I lost the belief that our leaders have our best interest at heart a long time ago. Everyone has to look out for number one. It’s just the degrees that separate good leaders from reviled leaders. “who I’ve met” is great advice. I need to get out more and expand my horizon. Happy to read an interview from a fellow DFW peep like me. The growth in DFW has been insane the past few years. Can you add a link to Reader Jake’s blog? I can’t find it. This was one of my favorite posts ever and there were not even any dinosaurs. I appreciate how authentic Jake comes across. I love that you do these interviews. I wish Jake were still writing. This bit is gold “Almost every single person who finally “makes it” will tell you money isn’t everything. So, either they’re lying or it’s true and the 99% of us can’t understand why – sort of like how it’s difficult to learn from the advice of others; but, too many people have to learn the lesson the hard way instead.” Thank you. Would love to read jake’s older stuff or former blog. Does a link exist? I agree that ‘work’ is not optional in the truest sense… we need meaning, purpose, and occupation. It just doesn’t have to be for the highest salary possible or even a salary at all, if our financial needs are met. The most meaningful and enjoyable work I do every week is tutoring someone in English (for free)… and mentoring younger engineers as part of my ‘real’ job (for pay). That is the ‘work’ I’m finding meaningful at this point in my life… the rest is just a job to pay the bills until I hit FI. Not that I don’t take pride and uphold my side of the bargain (quality work for pay) … but they definitely have to pay me to do most of it. It’s not fulfilling enough on it’s own for me to do for free, under the current work conditions my employer requires. “He [is] going to do the same things: sleep, work, eat, spend time with a spouse, make some friends and save some money”. “Billionaires are normal people, his locker was next to mine at the obscenely wealthy country club that 99.9% of the wold could never, ever afford.” That’s just tasteless. Be extremely frugal, work a job until you die…to what end? I hope there’s some tacit intent of at least giving to charity. I’m going to stop, this is too depressing. What an odd interview for a FI blog. Usually people have more aspirational perspectives. warrant UBER-PRAISE! As a way to attract them, you really have to have good, easy-to-read content. Great questions and answers. Thanks for sharing and providing such useful information.